Thirteen lakh units, that's the total number of X5s BMW has sold worldwide over the past 14 years. It is undoubtedly the German manufacturer's most successful SUV. The second generation model, which is currently on sale, alone has sold more than 50 per cent of the total volume. This particular model has been around for seven years, but has now started to look outdated. Also, with competition getting stronger, it's time for BMW to come up with a replacement. BMW X models are usually unveiled in cities that have hosted Olympic Games to go with the sport theme. Last month, we were invited by BMW to Vancouver, which hosted the 2010 Winter Olympics. This time, the wraps were pulled off the all-new third generation X5. By the time you read this, the new X5 would have already rolled out in international markets, and we will soon be seeing it on Indian roads as well. We've driven the petrol and diesel models and here's what we think of it. Look at it from a distance and it's unmistakably an X5, but get closer and you will notice that all panels are different, a completely new design and almost nothing is shared with the outgoing model. The face is now more in sync with the newer BMW cars, the most obvious change being the sleek headlamps extending all the way to the short and wide kidney grille. The headlamps still feature signature corona rings, but they are now flat-bottomed, and look even more spectacular in bright white, and they go well with the optional adaptive LED lights. The fog lamp is integrated higher up in the bumper and can now be specified to feature an LED if needed. From the side, the increase in length is evident while the height is now slightly lower. The silhouette has evolved from the older X5 but is still fresh. 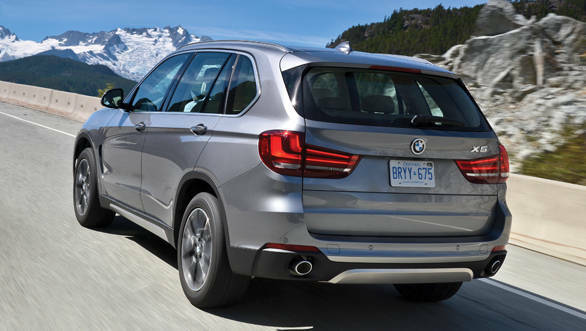 A few details such as the rear quarter glass design, long wheelbase and short front overhang are typical X5 highlights that have been carried forward. Viewed from the back, the large and stylish tail lamps stand out, while the twin exhausts add to the character. 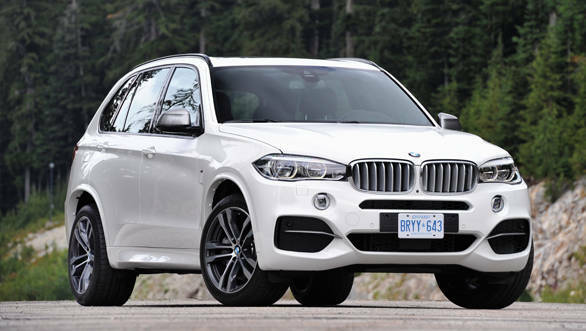 Overall the X5 is now more of a luxury and sport fusion and is very car like and less muscular. Step inside, and the SUV now feels more premium, the quality of materials and the attention to detail have improved as well. BMWs are known to have a similar looking dash in all their cars, but the new X5 clearly tries to breaks the mould. The simplistic design is still present but it has evolved. There is more leather on the dashboard and the layout is now more rounded. 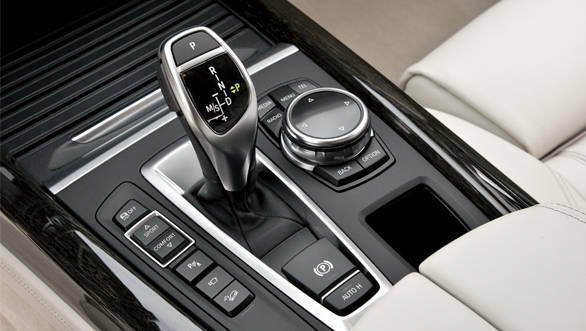 The iDrive system is in sync with the latest BMW cars with a cleaner and better-looking interface, while the new controller knob even features a larger dial that doubles up as a touch pad. The seats are much more comfortable, while the rear seats even feature heating (first in the segment). Most importantly, rear knee room has improved making it more spacious than the outgoing model. The overall cabin space has also improved, the rear seat can now split 40/20/40. As a result, the storage capacity can be increased from 650 litres to an impressive 1,870 litres with all seats folded. Additionally, the door pockets can now accommodate larger bottles. 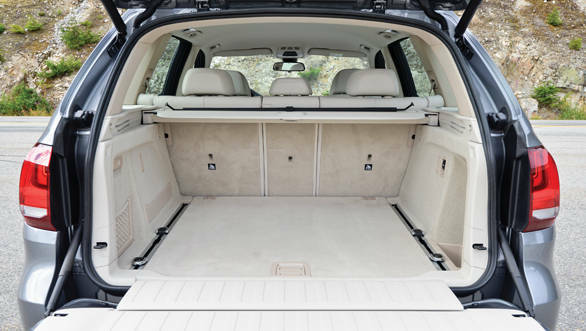 The typical X5 split tailgate has been retained, this means the lower section can be folded flat making it easier to load heavy objects, while the upper section can now be opened and closed automatically. The biggest change, however, in terms of cabin space is the third row seat option. 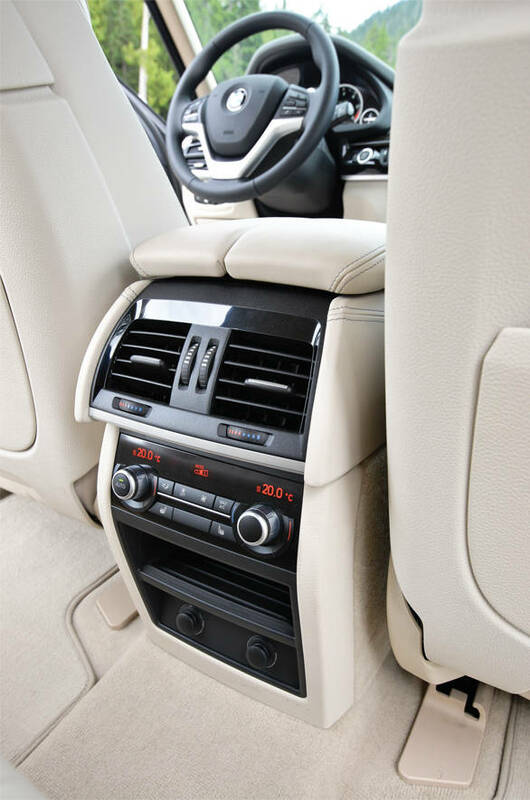 The X5 has always been a five-seater but now with the third row bench seat it becomes a seven-seater  not a proper one but the optional seat can accommodate two children comfortably. It has to be seen if this model will make it to India, but if it does, expect many takers. The 8-speed auto is standard and offers smooth and quick shifts. 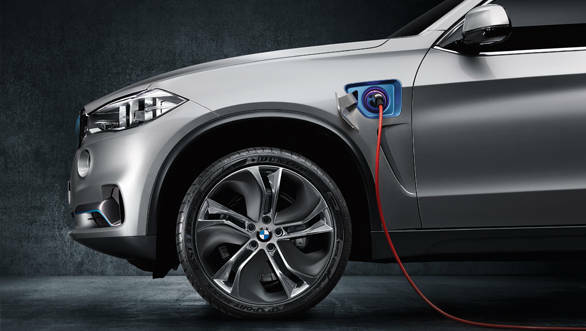 In international markets, the X5 will initially be available in one petrol and two diesel versions. 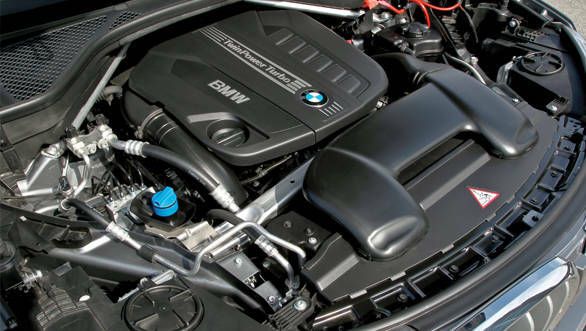 The xDrive50i features a 4.4-twin turbo V8 that puts out 450PS of max power and 650Nm of peak torque. All this power helps propel the SUV to 100kmph in 5 seconds flat (claimed). It isn't, however, confirmed whether or not this variant will come to India. But the one that's coming for sure is the xDrive30d. The 3.0-litre, straight-six diesel motor is the updated version of the one in the outgoing model. Max power is now 258PS at 4000rpm while peak torque of 560Nm is available from as low as 1500rpm (up by 13PS and 20Nm respectively from the older X5). The engine has become more refined and is mated to the smooth and quick shifting 8-speed automatic gearbox that helps offer an even better combination of power and efficiency. The sprint to 100kmph takes a claimed 6.9 seconds (0.7 seconds quicker than the outgoing model) and despite power going up slightly, fuel consumption has improved by a claimed 16 per cent. Out on the road, the engine now feels much more refined and power delivery is linear. 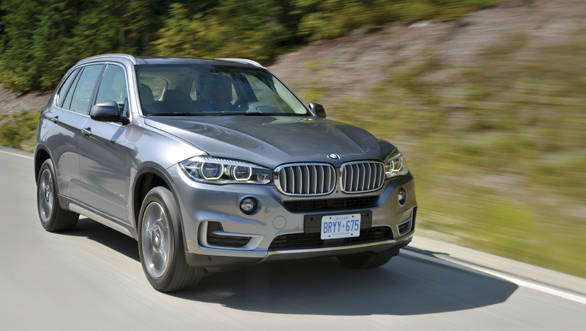 Cruising at high speeds is even more effortless, making the new X5 an ideal highway companion. There are also various driving modes including the ECO PRO mode that alters the throttle response and transmission characteristics to improve fuel economy. A coast function decouples the engine from the rest of the powertrain to help coast without engine braking. Driving dynamics have also improved, and though the diesel felt slightly front heavy, the experience is now more car like and less SUV. To further improve dynamics, one can opt for the adaptive suspension. 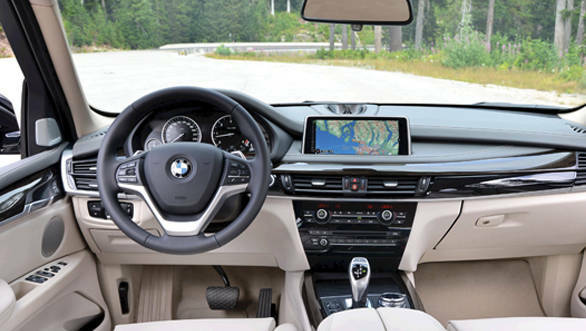 The steering is electronically assisted in the xDrive50i and xDrive30d models, and as is the case with most modern BMWs, the steering feedback and weight is impressive. One can also opt for an active steering that adjusts power assist and in turn can reduce steering effort especially at slower speeds. The all-wheel drive system is more intelligent and lighter while torque vectoring is standard in the optional adaptive suspension package models. Another new feature in the X5 is the xDrive status display. This function uses real time 3D graphics to display body-roll and pitch. We found this feature quite handy while off-roading. In terms of safety, there are airbags for the front passengers, and side and head airbags for the front as well as rear passengers. Optional features are a 360 degree camera, night vision, head-up display, park assist, lane departure/change warnings and cruise control with a brake to standstill feature to name a few. The all new X5 has improved in every department and in turn aims at giving the competition a good fight. However, prices are expected to go up and we will have to wait and watch if it is significantly higher than the outgoing model. This wait will end when the new X5 debuts in India at the 2014 Auto Expo.